Fulfilling the need for a practical user's guide, Statistics in MATLAB: A Primer provides an accessible introduction to the latest version of MATLAB and its extensive functionality for statistics. Assuming a basic knowledge of statistics and probability as well as a fundamental understanding of linear algebra concepts, this book covers capabilities in the main MATLAB package and the Statistics Toolbox. The student version of MATLAB presents examples of how MATLAB can be used to analyze data and offers access to a companion website with data sets and additional examples. It contains figures and visual aids to assist in application of the software and explains how to determine what method should be used for analysis. 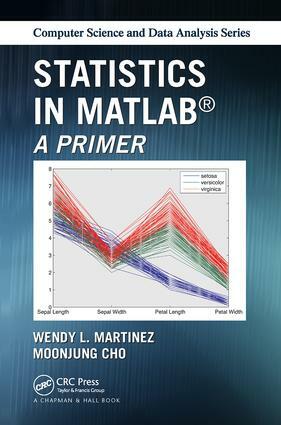 Statistics in MATLAB: A Primer is an ideal reference for undergraduate and graduate students in engineering, mathematics, statistics, economics, biostatistics, and computer science. It is also appropriate for a diverse professional market, making it a valuable addition to the libraries of researchers in statistics, computer science, data mining, machine learning, image analysis, signal processing, and engineering. MATLAB Basics. Visualizing Data. Descriptive Statistics. Probability Distributions. Hypothesis Testing. Model–Building with Regression Analysis. Multivariate Analysis. Classification and Clustering. Wendy L. Martinez is a mathematical statistician with the Bureau of Labor Statistics in Washington, District of Columbia, USA. She has co-authored two additional successful Chapman Hall/CRC books on MATLAB and statistics, and has been using MATLAB for more than 15 years to solve problems and conduct research in statistics and engineering. MoonJung Cho is a mathematical statistician with the Bureau of Labor Statistics in Washington, District of Columbia, USA. She has more than10 years of experience in survey methodology research and applications, and is knowledgeable of other software packages, such as SAS and R. She is able to use this knowledge to enhance the utility of this book to users of other statistical software packages.